With the release of Survios’ new immersive music creation tool, Electronauts, fast approaching, I got to sit down with Nathan Burba, Hunter Kitagawa, and Jade Hirtle to learn more about the company’s history, their approach to making VR titles, and the music, artists, and creative process behind the creation of Electronauts. Please note that, due to length and wandering conversations, this interview has been slightly edited to remain topical. Would you be so kind as to tell us you tell us who you are and a little bit about who you are, what you do, and your company? Burba: Sure! 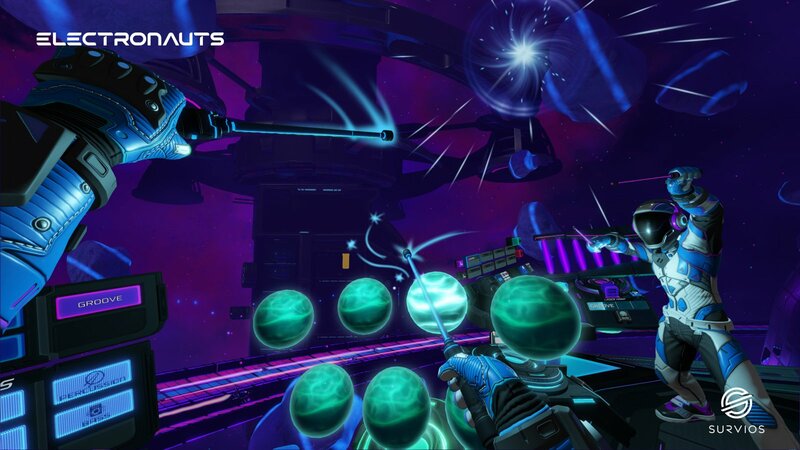 I’m Nathan Burba, I’m the Co-Founder and President of Survios, and Survios — we’re one of the premier virtual reality companies out there, we produce titles such as Raw Data and Sprint Vector, and our third title coming out is a title called Electronauts. We’ve been developing it for over two years, it’s basically a creative, exploratory music title, and one that we’re working with a lot of different artists on. It’s just a very exciting, fun project that’s kind of um, it’s a very experimental product, it’s kind of hard to describe. But it really empowers you feel what it’s like to really be a musician, and to perform like a musician, and to perform with some of your favorite tracks that are out there today. Kitagowa: I’m Hunter, I’m the product marketing manager for Electronauts and the Marketing Manager at Survios. Hirtle: And I’m Jade. I work on the PR side! What inspired you to create Electronatus? Burba: So, basically… where to begin, where to begin? Back when I was at USC, before the start of Survios, or right around the time of the start of Survios, I caught wind of a small game called Plink, and Plink is a kind of a game made by an advertising company — probably just made by one or two people — and it’s a little quantized music app, and it’s something that … I kind of became obsessed with music quantization [the ability to constrain the input of notes] at this time, and the idea that you could have an instrument or–that I could play something on a piano and sound good even though I’m good at piano. Because I’d always wanted to become a musician, but I’d never really learned how to use an instrument properly. Right around this time I’d also discovered what an arpeggiator was, and kind of what arpeggiated notes would be. And if someone had set up an arpeggiator [or a synthesizer] correctly in a music program, I could, once again, go over to a keyboard, hit a few notes, and sound amazing, even though I’m not. So this idea of kind of empowering someone to be a musician was something that I was kind of catching wind of. So, about a year later, we had, as a company, put aside some of the hardware that we’d been developing at that point, back in 2015… So, basically, back in 2015, we had been developing hardware, we had our own head-mounted display that we’d developed, along with some other hardware, and basically we took a few members of our hardware team and we wanted them to focus on software. We basically started building a small music prototype that wasn’t even in VR, but i tas something that was just… could we make a few quantized instruments, and could we just play around with actually make something musical that people could enjoy without any training? And so we ended up making what’s called–the game was code-named Body Jam, and we had this little Body Jam prototype that we made that was on controllers, and just this tiny little prototype was incredibly fun. The ability just to hit a few buttons and actually make music. ,and basically we just started adding elements to that and creating an interface around making music in virtual reality. And so that’s how we came up with a lot of the interfaces that you see in the game: orbs and changing the track and all those kinds of things. Then we started building on to that, and building onto that, and building what’s called the Music Reality Engine, which includes those real-time quantized elements, and the ability to change all the tracks, and basically brings temps in from a song together to be able to have full control over that. And then, after that, we actually have started bringing in outside musicians to work with, and signing licensing deals. So this product is both innovative technically, but it’s also innovative from a legal standpoint. And the ability to actually get artists to agree to hand over the stems of their songs, and to put them in the game and allow the user to change them at will, and at real time, that’s something that really has never been done in a game before, even a game like Rock Band! Normally, they’re giving you the final, kind of, master of the track, or maybe they’d give you three tracks or something, but they won’t give you all the chopped-up stems. So this gave us an unprecedented level of control, and then basically the challenge, for us after that, was actually to put all the music together, and actually have a wide number of tracks, kind of like a Rock Band or a DDR, so we could actually have a game that was fully featured and had music for everyone. So, that kind of brings us to today, when we’re getting close to launch. And you can have more than one person playing, right? Burba: Right! We have multiplayer, and that was a big part of it, even from that very first prototype. I remember–as the story goes, or as I remember it in my head, is I was holding a controller, playing an instrument, and I was standing next to Seth–Seth Pierson, who’s now the CEO of the company. And basically, this is when Seth had first joined us and was doing some consulting work. So, Seth and I are playing, and we didn’t know each other too well at the time, but I’m playing on one controller and he’s playing on another, and we’re just kind of jamming together a little bit, and we kind of look at each other and… basically it got a little too–it got a little weird. It was like, this is a little too cool, I don’t know this guy, and we quietly put the controllers down. It was like, this is amazing, but that’s enough of that. That was kind of an awkward male moment there early on in the project, but we really knew we had something special there, if we could get such an emotional reaction, especially between two people playing together, doing call and response, or one person playing one track, another person playing another track. So, with the multiplayer side of it, we really wanted to create something where you could have that connection with someone, and you could basically be playing music together. As the saying goes, “Make great music together.” So with multiplayer, it very much is two players, and you can connect with anyone over the Internet to play, if you have two systems, you can play locally. It’s really is the first time that there is a music game that you can jam together with other people online. And the reason it’s possible to do that with the latency that the Internet has is the quantization, and that is actually the trick that allows that to occur, and not make it so it’s hard for you to sync up with someone else. So, from that standpoint, it’s also a revolutionary product. All of Survios’ games involve multiplayer, be it working together or racing against each other, you’re really bringing a lot of social components that, I think, a lot of other VR games are lacking. Burba: Our mission at the company… we basically have three key things that we’re trying to do for people. It’s immerse, empower, and connect. So the multiplayer side of it really is the connection side, so we see it as… you’re connecting the people who are creating the products with the people who are creating them, we’re also making products that allow people to connect with each other, and that’s a really important part of our mission. Ultimately, these are all tools that allow us to have a deeper connection with each other and the world, and they’re not meant to be isolating at all. Can you tell us about some of the artists who have contributed music to Electronauts? Burba: Yeah, so we’re working with Steve Aoki on his track with Boehm and WALK THE MOON, is Back 2 You, and that’s a really solid track that we have that’s really, really fun to play. Hunter, you can talk more about the Dim Mak relationship, and all the tracks we’ve got from them? The fantastic record label in in LA! Burba: Tipper — it’s like, it’s a bunch of very popular artists today, cutting edge artists today as well. Some solid hip-hop stuff in there, 12th Planet, Del The Funky Homosapien, who’s a legend. Just a bunch of just incredible artists. Burba: Yeah, she actually played a Jovian track, yeah! And it was great. I did play it, it’ll be in the mixed reality video. It was fun! What’s been your favorite song to remix? Was there one that remixing gave you an entirely new understanding or outlook on the song? Kitagawa: I don’t know, because a lot of the stuff we have that’s really fun is upbeat and light, but the thing that I personally like playing the most, is like the TOKiMONSTA tracks, ’cause they’re deep. They can start slow, and then you can really, really build. They’re a little bit harder to play–that’s the thing, some tracks are easier to play. They’re easier to just hop in and you hit the orbs and you go nuts and you’re gonna sound great; other tracks are, I guess, a little … more difficult to play but when you master it, it can really sound amazing. It can really sound like a real track that can go on the radio. Burba: I’ll say that I’m kind of partial to some of our homemade tracks. We have a number of DJs who are putting music into the game, and have more music coming for it, and it’s kind of… a bunch of my friends, we’re kind of like pumping everybody up to get their music in there, and some of it’s the most experimental stuff. Some of it’s like, Kilp’s Coral Fusion, some of his stuff that’s in there, I would say, is honestly some of my favorite, just because it’s so experimental. Kitagawa: Yeah, yeah. What about you, Jade? Burba: What’s your favorite song, Jade? Halvorson: Um… that’s a good one. I kind of like the Krewella one, I just like things that are a little bit on the happier side. But, I mean, it’s something that’s a bit summary, because it’s summer, guys. It feels good! Hirtle: I like the one where you get to scratch, too! There’s a track where you actually get to scratch, and so those orbs are like a scratching tool. So, I can’t scratch… but have I dreamt of it? Yeah! So yeah, to actually get to scratch, and it sounding great was one of my favorite parts of that song, and it’s fun! But, I think it’s all personal choice about the sounds, and how it makes you feel, and how you resonate with every song, but also, too, if you recognize the music, then it’s even stronger, the bond, I think, between the room and the song and you. Burba: Yeah, what I found the most fun in Electronauts was to get about ten people together, five people together, whatever, in a small room, a living room or whatever, and just perform! Perform for your friends, perform for ten, fifteen minutes and kind of pump the crowd up, and then take turns and switch it off with other people. That’s really… whatever you can get people going with, that usually works really well. Hirtle: That’s what we talked about, how that could be a really great way to play Electronauts in a group setting. And that’s what we’re hoping for, really. It’s just like, you can just use this in so many ways, and we’re just gonna see how people use it. I was lucky enough to get to see the really cool presentation you all did at your E3 party. Burba: Oh yeah, at the E3 party we had the Rhino Bus, which is a Burning Man art car, and it had like, those giant wind sail foil things on top that was open, then we had a giant projector next to it. And we actually had Jovian, who is an incredible DJ on Twitch, as I mentioned earlier, he DJs for three hours a day on Twitch, and he’s incredible, he was there as one of our DJs, and he was streaming his DJ set on Twitch to his Twitch channel. It was just… it was just insanity, right? And the idea is, we’re trying to democratize music with this. We’re trying make it so that music is something for everyone, it’s not just for a select few talented people, or technical people, but it’s something that everyone can get into. And then, eventually, this product will teach you how to actually… you know, give you that initial piece of knowledge that you can use to start learning how to DJ yourself. Kind of, get you familiar with some of the terms, get you familiar with some of the music, so that you can become like some of those DJs, and DJ your own parties, as well. So, it’s something that we all aspire to get into, and the E3 party is, you know, that’s kind our big… that’s just our big blowout party we have every year, where we try to one-up ourselves every single time, and really kind of, you know, see what this product is capable of, from a DJ’ing standpoint. This one kid comes up, and there’s no one around, it’s pretty empty, ’cause we’re in this corridor where people are going from stage to stage, and this kid comes in, and tries it, and he… he just gets lost in there. And so he’s playing with one of our guys, and they’re just jamming together for 20, 30 minutes… and when he goes in, there’s no one around, but when he comes out of the headset, there’s this crowd of people, and people are dancing! And they start cheering for him, and he’s like, he’s like… “What just happened..?” It was pretty amazing. If you’re a DJ, can you upload your own music and assets and start playing with your own music? Burba: So we want to do that… So basically, we call that… broadly, what we want to do is called “mod support.” I’ll just be brutally honest: We didn’t have time to get it into the game. Of course, we need to ship our products on time, we need to ship them on budget; that being said, mod support is something we really want to do in the future, and if there’s enough people asking for it, and enough support of the game from the community then it’s something that we would like to get into the game in the future in some way, shape, or form. Ultimately, we want to teach people how be DJs, and how to be musicians with this, and that would be the next step. I know I, personally, wanna DJ shows with music–I actually wanna go on Spice and use samples from Splice, put them in the game, make a show out of that for myself, and then be able to DJ. So that’s something that we’re… that we want to get in the future, but right now we do not have mod support. Something for people to look forward to, if they want to show their support. Burba: Yes, please ask for mod support, and if enough people ask, I’ll be able to get it in there at some point! I can talk about a few other things, so there’s a ton of music coming out at launch, and then we have some more music that we’re planning that’ll be for an update as well. This is something that we’re just excited to put content into. Can you turn off the quantization? Burba: One of the features requested from the number of musicians that we had tested it with, is basically you turn off quantization, so you’re basically playing in real time. And so, for example, Henry [Halvorson] was doing this the other day–Henry is one of the designers of the game–he was able to play Triplets and kind of drum a little bit faster based on having quantization off. So for any expert users, you can do that–and you can do it in real time, too! So if you’re in the middle of a set, you wanna [switch] quantization off, do a little drum solo that wouldn’t be as possible with quantization, that’s a possibility. I know it’s a long list, but can you tell us about a few of the instruments you get to play in Electronauts? Burba: So there’s ten primary interfaces in the game, basically you have–they’re all designed from the paradigm of just being very easy to use. So they have very large hitboxes, and are very responsive. The primary one is the orbs; you have seven orbs that are all in-key and basically you just hit them. It’s very, very simple, they’re very juicy, and they provide great feedback. Then you have a laser harp, which has seven strings, which is just kind of a different take on the orbs, just it’s a different kind of sampling instrument. There’s a synth ball, and the synth ball is basically just this very cool kind of like… Tesla coil looking coil kind of ball that you can stick the stick into, and you can play… basically a synthesizer inside of that; some of the songs have a synth ball. There’s the backer tracks themselves, so you can change what’s in a track, there’s usually up to six tracks, and then nine stems per track, so you have full control over which pieces of the track are playing. If you turn them all off, the whole song will go quiet, so you actually have 100% control over the song. There is the looper, which is basically five different tracks and you can fade up and fade down so there’s like little faders, you can bring those in during the song. So we kind of break it up into different pieces that let you maintain a lot of that control. There’s a remix cube that lets you apply filters over the different tracks, those are very easy to use and you can automate those filters, there’s vocals, which allow you to not only play up to three different vocal tracks, but you can then remix them live and in real time. And then, finally, there is the arrangement tool. The arrangement tool lets you actually build an entire song. So you can actually–we didn’t show that to you, it’s the most advanced tool–but you can actually build a whole song with different sequences, and essentially make something that’s like, 10 minutes long, 20 minutes long, up to that if you want to, and then use that as a tool to help you DJ, or build it to make an entire song, listen to the song, play it yourself, and it all culminates in the arrangement tool. I think my personal favorite tool are the sound grenades, can you tell us more about the idea behind those? Borba: So the sound grenades I think were–the grenades themselves were my idea, but they were based on Henry’s knowledge of music. Henry calls them one-shots, and so, typically, they’re one-shots or sweeteners. So a lot of these interfaces are based on us analyzing what makes a good song, right? What elements you need from a song, and how you can pick things apart. And usually you’ll have a little sound before a transition, right? And so, inevitably, we decided on the grenades because we could sync them up to the quarter notes, and five seemed like a good number. And then what would happen is, we would, you know, dissect a song, take the stems from a popular song, get it into the game, and we’d be like… “Oh, there’s only enough sweeteners in here, or one-shots, for like, two grenades, we’ve gotta make up three more.” So, inevitably, we would make new sounds, or grab samples from various resources that we had, and they were just, the would just be funnier. They would be this interesting little extra icing we would add to the song. So, if you play Mist there’s like a dolphin noise in there. It’s like… why not, right? And that’s why we’re excited to eventually… hopefully… to get mod support in there, because then people can add, you know, you can add all sorts of weird sound effects. I know, Hunter, you wanna do like, a sound board. Kitagawa: Yeah, basically, someone could chop up Arnold Schwarzenegger lines, and they could just put them in and make a song with, like, “Put that cookie down!” And just remix it. The one shots are fun because they’re like adlibs, right? What’s a Little John song without “Yey-eah!”? You need those! Is there anything in Electronauts you didn’t think you’d be able to include? Borba: Yeah, at one point we were considering shipping the game with no external artists because it was so much fun just with some of the songs we’d produced, but we started going down the path of “will artists be into this?” You know, we weren’t really 100% sure, and as we started talking to people, what we found was that there was very much a thirst for kind of getting their content into virtual reality. People were very excited about VR, but a lot of people weren’t really very sure what to do with it, so this was a perfect opportunity to say: we can take music that you already have, you’ve probably already monetized it really well, because you came out with the song five years ago, or something, we can take the stems and basically… help you kind of re-monetize that song, and get it in here, and kind of breathe life into a song, let people listen to it with fresh ears, so to speak. You’ve got some pretty big names in this game, have you had any of those people come in and play their songs in VR? Hirtle: 12th Planet, we have a video! Borba: Yeah, I think Dada Life… yeah, in particular, it’s really special when you get a musician to play their own tracks, too, because they’re just seeing it in a whole new way. And they know the ins and outs of it, so they can really DJ really well with it. Kitagawa: What might be even more special is when some of the artists have had a chance to see other people play their songs live. And to see what someone else does with your song, and the sounds that you made, and put their own spin on it, and make something amazing, and have all these feelings, I think is really special for them. I can’t wait to see what kind of experiments people do, ’cause I think we’re just scratching the surface with this thing, with the things that we’ve done. We haven’t done a whole lot, there’s a lot of things we wanna do, but I think other people are gonna have really creative ideas of how to use this in a broader question. Other than getting artists on board, what was your biggest challenge in creating Electronauts? Borba: There was also the technical side of things, this is a very experimental project. This is not a project where we wrote down the design on paper at first and then went ahead and developed it, and because of that, the project kept evolving over time. We were adding features as we were experimenting, there were a number of dead ends; we tried to add game modes, but it just didn’t quite feel right. The technical side of things was incredibly difficult. We have an entire engine that we built in… the game itself is built in Unity, but we have another engine that we built in a whole different technology called PureData, and that’s the Music Reality Engine. So, that engine sits separately, so being able to build that was pretty difficult. Some of the technologies we’ve used have not really been used that much outside of academia. Things like PureData and Faust, in particular, no one has really shipped a commercial title with some of those things. So it’s very cutting edge, to the point where we were calling these companies and kind of helping them work on their technology, and adding to them as well. So yeah, it’s very much a bleeding edge game. Is there anything you’d like to say to anyone looking forward to Electronauts? Borba: Just… if you’ve ever wanted to play music or be a musician, and you’ve maybe, perhaps, given up on that; you’ve maybe gotten too old to learn how to play a guitar properly, or that sort of thing, this is for you! This is for the person who has an interest in those things, but just doesn’t have the time. You can get in there and, with no training, really just feel like you’re just an incredible musician, and do it with your friends, and be able to jam in real time. Kitagawa: Yeah, and as someone who–I’m someone who loves music, but I can’t play instruments, and I don’t know how to make music, but I love music! For me, I have feelings from this experience when I play. So, if you’re someone like me who loves music but has never had that experience of making music, you have to try this. Borba: It’s an incredible, incredible feeling. Kitagawa: Because you’re gonna have new feelings, new emotions, you’re gonna have a new connection to music that I don’t know if you’ve had before. So try it, please try it. Electronauts will be available on HTC Vive, Oculus Rift, and Playstation VR on August 7th. Check out our hands-on preview for more mixed-reality music, and our news article to see the complete list of artists and songs included at launch, or head on over to the Steam page to add it to your wishlist.